Food is a powerful force! Its capacity to turn ones stress to happiness is amazing. You know what makes MISO happy? Ramen! It is joy in a bowl. 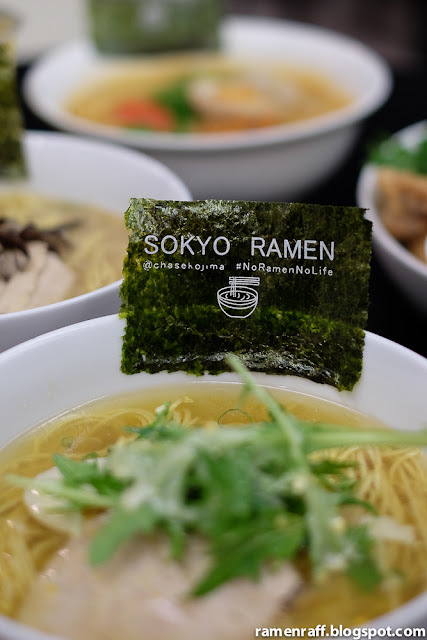 No ramen no life right? 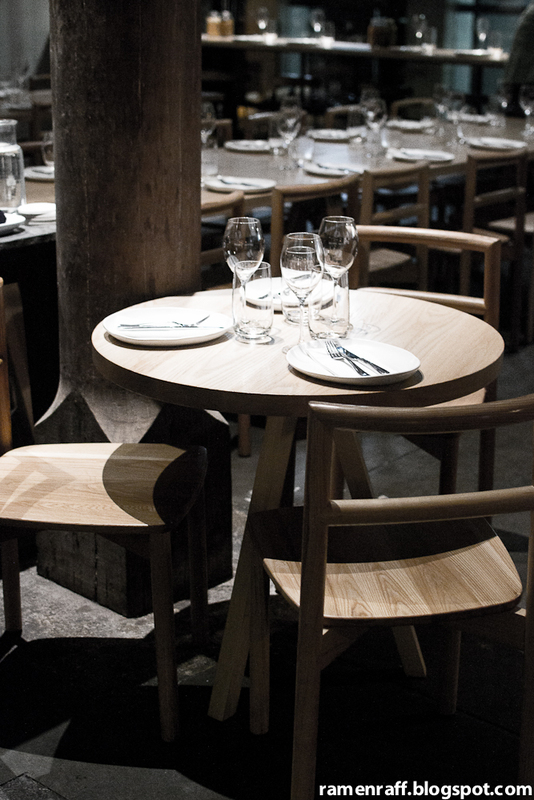 I admire the sight of its harmonious construct and the way the ingredients work together to deliver that ultimate comfort. 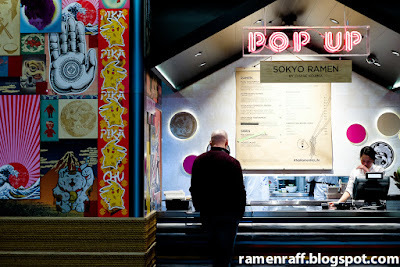 So when I heard about a ramen pop-up by the renowned Sokyo at The Star was coming up, I made it my mission to visit. Sokyo's Executive Chef Chase Kojima is one of the dopest chefs in town. His hip little ramen joint is located at the The Star's food court. Just look for the Pikachu wall prints! 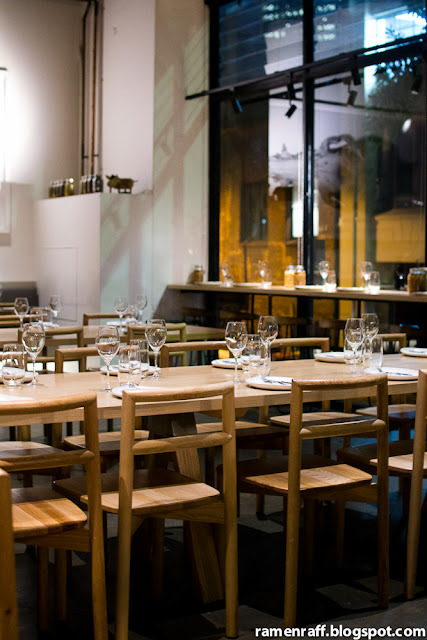 They offer four types of ramen, some snack-size dishes and a range of drinks. 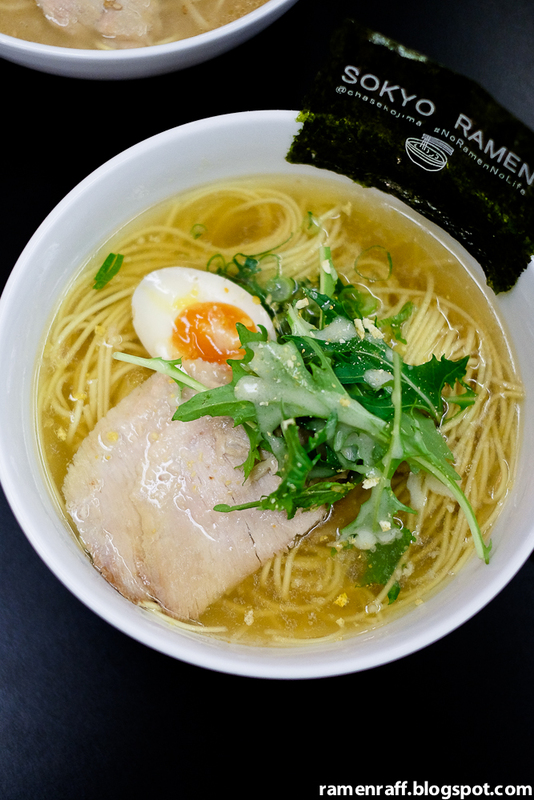 If a globally successful chef trained in traditional Japanese cuisine like him says he will do ramen, one makes their way there ASAP! The Gyokairui Tonkotsu Ramen ($16) was absolutely beautiful! 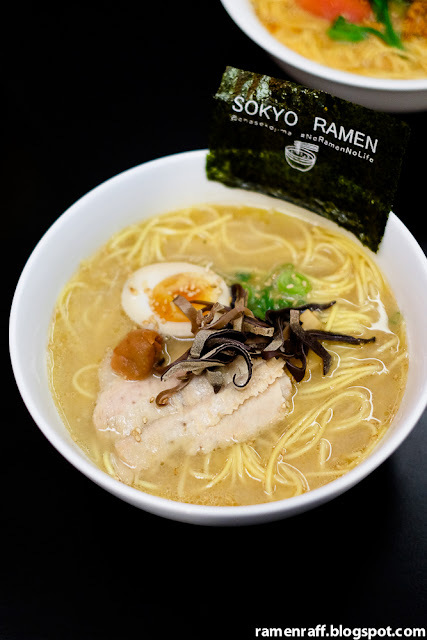 The light tonkotsu broth had a blend of pork, chicken & seafood Dashi that gave it some depth. Toppings include pork cheek chashu, marinated egg, nori, shallots, and black fungus. I also really liked the firm egg noodles (same noodles used for all their ramen). The pork cheek chashu was tasty and the texture was like super tender ham. Out of all the tantanmen I have tried in Sydney, their Spicy Miso Tantanmen ($16) is the most well-balanced I've come across. The sweet miso based broth starts out light then next thing you know the flavours and heat starts to creep up. The toppings include pork mince, marinated egg, nori, sesame seeds, and black fungus. I love how the sesame adds that roasty accent to the broth. The Yuzu Shio Ramen $15 is almost like a Chinese style noodle soup but with a citrusy flavour in the light chicken and katsuobushi dashi based broth. I like the sweetness that comes from the zest too. Toppings include mixed green salad, pork cheek chashu, marinated egg and nori. I was also able to try Mai-san's Fried Chicken ($9). 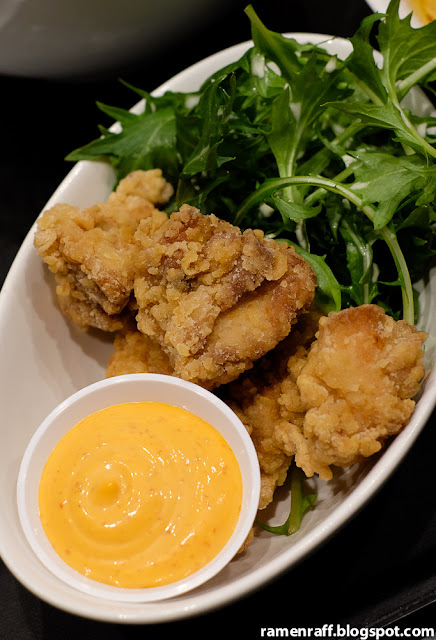 It's a ridiculously amazing marinated sake soy chicken karaage dish! I enjoyed the light crisped and slightly doughy batter. The meat was flavoursome and juicy but not oily. It went well with the spicy mayo. The Yuzu Pop Soda ($5) was refreshing! 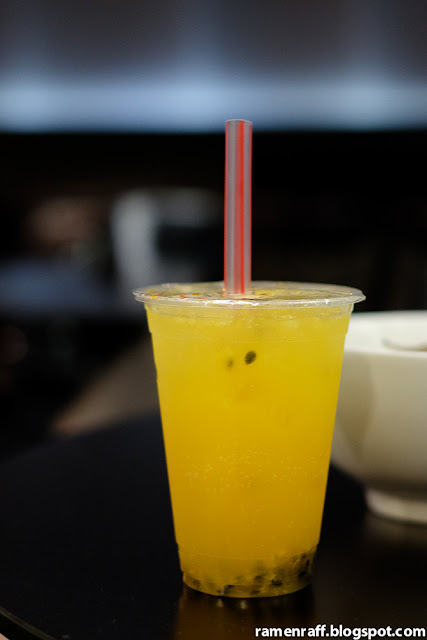 It had a nice balance of passionfruit and citrus yuzu flavours. 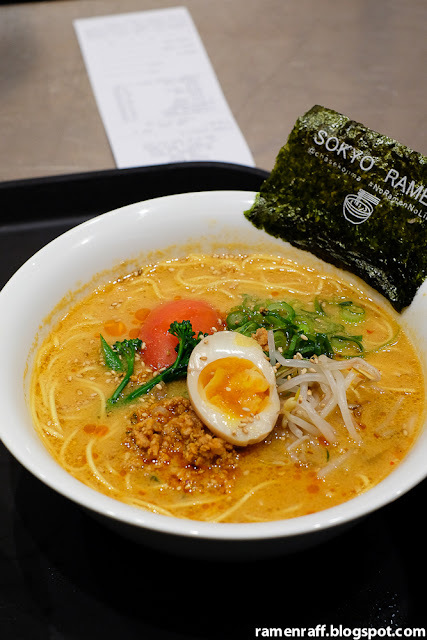 Sokyo Ramen is worth a visit! Get there soon as their pop-up will only be there for 3 months starting from the 10th of September 2015. Follow Chase Kojima on Instagram for further updates. I have devoured a lot delicious dishes in my journey as Ramen Raff. But every now and then, I would come across a cafe or restaurant that would leave a stamp of awesomeness in my food obsessed heart. The renowned Nomad in Surry Hills is one of them. 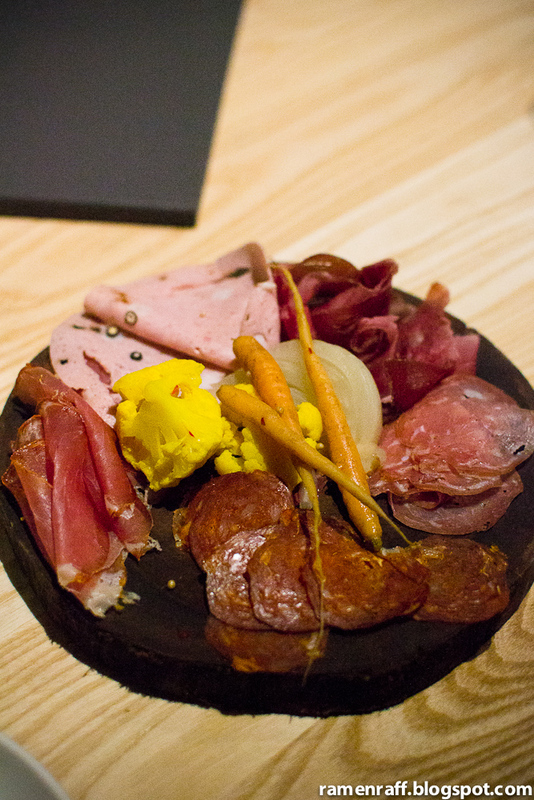 We started with the Nomad Charcuterie with Pickles ($27). I loved all the house-cured/smoked meats but the pork & fennel, chorizo and mortadella were standout for me. I also enjoyed the pickled baby carrots as they really complimented the cured meats well. 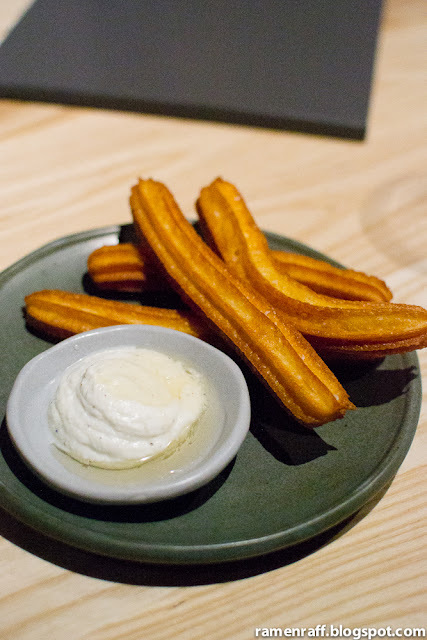 Suze and I both agreed that the Goats Cheese Churros with truffle honey ($18) was the star of the night. The savoury goats cheese churros were super fluffy inside with a nice crisped surface. To have a truffle honey yoghurt dip with it was just pure brilliance. The balanced combination of sweet, creamy, sour and earthy flavours worked a treat. There's a reason why this dish stayed on the menu since its debut on day one. We enjoyed it so much that we had it for dessert too! Just to balance things out, we ordered vegetables in form of their BBQ Cauliflower with Almond Tarator and Manchego ($16). 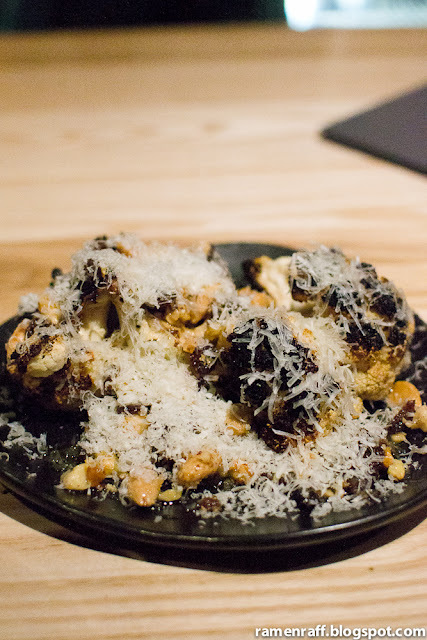 The sweet, nutty and buttery almond tarator along with the sharpness of the grated manchego brought the best out of the smoky bbq cauliflower. For our protein intake, we ordered the BBQ Wagyu Skirt with Charred Mushroom and Pedro Ximenez sauce ($40). 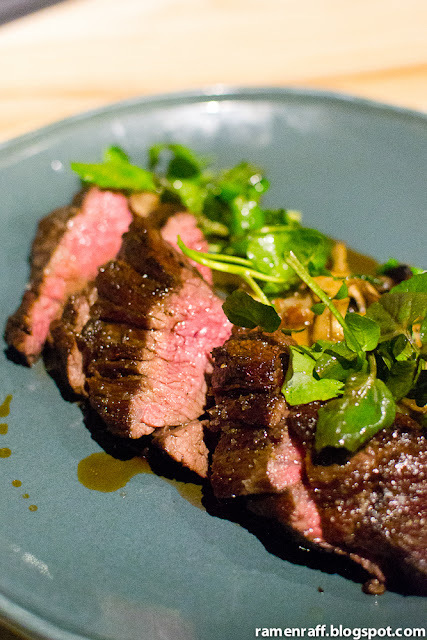 The tender wagyu skirt was rare and cooked perfectly. The sweet charred mushroom was the perfect accompaniment to the wagyu skirt. 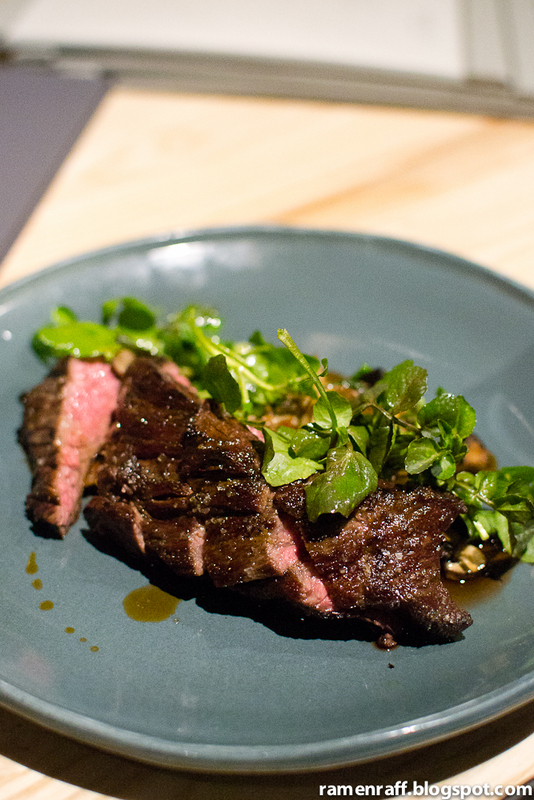 The molasses-like flavour of the Pedro Ximenez was nice for cutting through the richness of the fatty wagyu meat. This was another flawless dish. 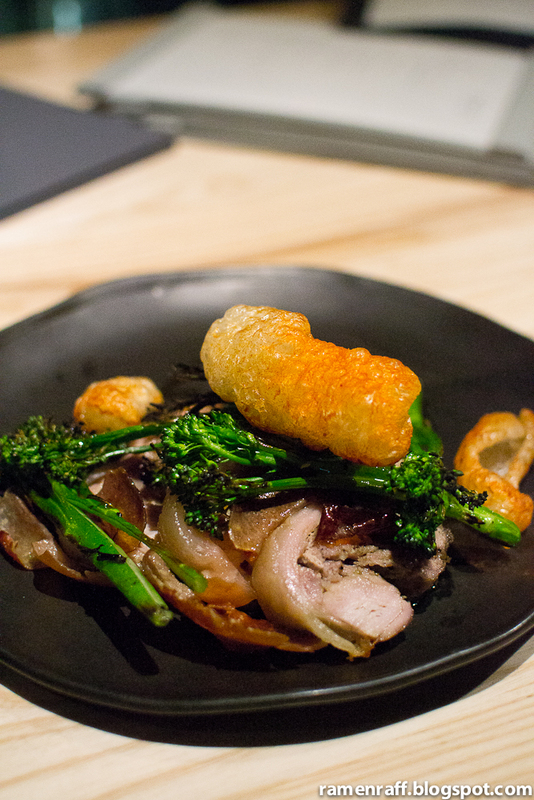 I'm bias to pork especially if it's a perfectly executed dish like their Wood Roasted Suckling Pig with stuffing, broccolini, chilli burnt butter ($39). The pork meat itself was tender, flavoursome and slightly on the smoky side. The broccolini was nicely cooked and the stuffing was like meatloaf only softer. The highlight for me is the two types of crackling: the air puffed crackling with chilli seasoning and the thin-crisped crackling. The glorious thin-crisped crackling reminded me of a Filipino-style lechon crackling. 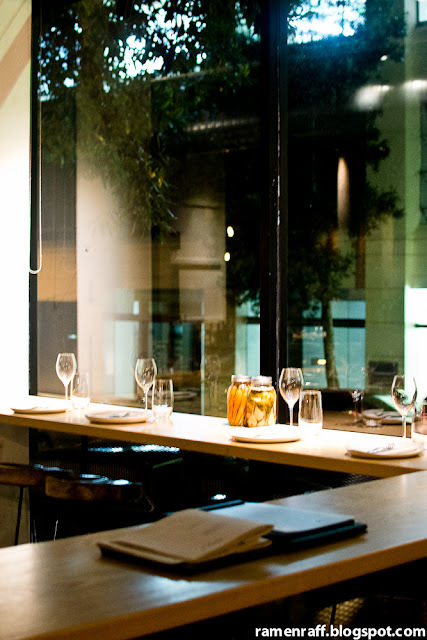 This has been one of my best dining experiences. 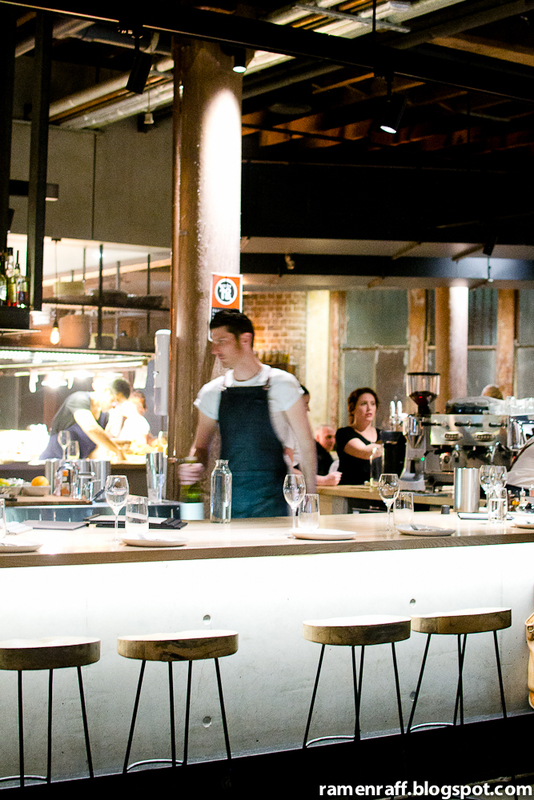 If you haven't been to Nomad, get there quick!